Hi there friends! What's new with you? I've been doing a little of this and that, some sewing, some stitching with friends, some little bits of yardwork, the usual stuff for this time of year. 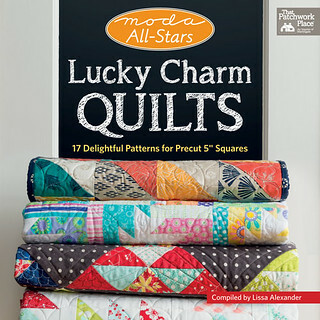 I was very lucky to receive an e-copy of Lissa's new book from Martingale Lucky Charm Quilts. The photos by Brent Kane are courtesy of Martingale, you can see more quilts from the book on their website. Like all books from Martingale they have clear and concise instructions with great illustrations, perfect for those who read every word and those who like to follow the photos! 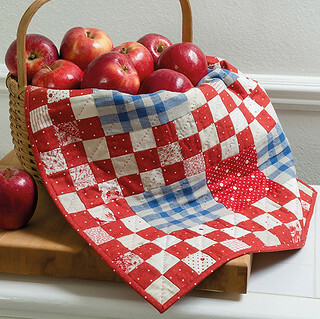 I love the cheerful colors of the quilts, but if you like a country look there are projects for you too. The book features lots of Moda designers we know and love, Bonnie Olaveson who made Flying Geese. This is Spring Mosaic by Sandy Gervais. 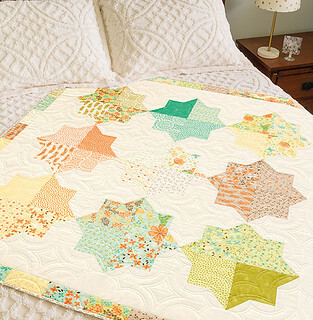 I love this cute small quilt on a chenille bedspread! I love this one by Laurie Simpson, Tea Time. This is the quilt I wanted to make right away when I flipped through the book. Of course there are many other friends included featured, these were just three quilts that popped out when I looked. Next time I'd pick three different, the projects are all so cute. I wasn't kidding, I did get busy and I started cutting and sewing right away. I didn't have charms so I just pulled out my scrap bin and chose all the white background things available. While I didn't have the variety I would have with a charm pack of fabrics, it still is cute. 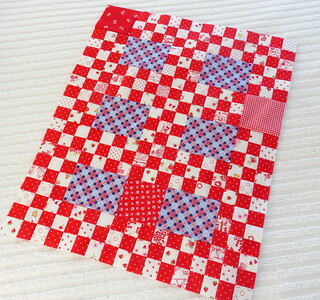 I liked that the red was a single fabric aside from 3 charm squares, easy cutting! I think it does capture the same look even though I didn't have some cool linen to include, instead choosing a blue and red plaid. 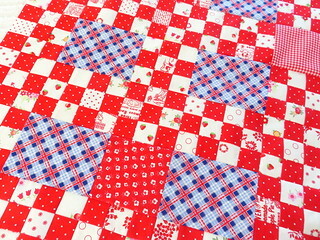 I would have had this quilted but shocker, I had no more small pieces of batting laying around, which means thank goodness I've used it all up! I'll head out for more this weekend. This will be so easy to machine quilt, but if I was a hand quilter it would go fast as well, it's pretty small and the small squares will lend themselves to a diagonal grid with out marking. The book is full of projects for those charm packs but you can easily use yardage or fat quarters... it's all fabric! I really think you might enjoy it! 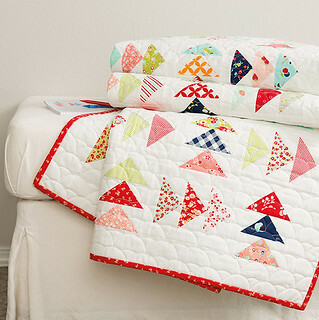 If you pick it up let me know which quilt is your favorite! Hope it's all good with you friends. Happy weekend! It is beautiful - and at first glance, thought it had the same fabric as the picture in the book! Now you will be all ready for the 4th of July :)! This is so gorgeous! Love the fabrics you picked for your version and love Laurie's too. What an inspiring book.